​Arsenal are running away with the FA Women's Super League title and remain on course for their first triumph since 2012 after opening up a six-point ahead of Manchester City at the top of the table over the weekend and extending their 100% winning start to eight games. Arsenal thrashed Everton, bottom of the table and win-less, on Sunday. Usual suspects Danielle van de Donk, Jordan Nobbs and Vivianne Miedema (2) were all once again on the score-sheet in the rather one-sided 4-0 victory. 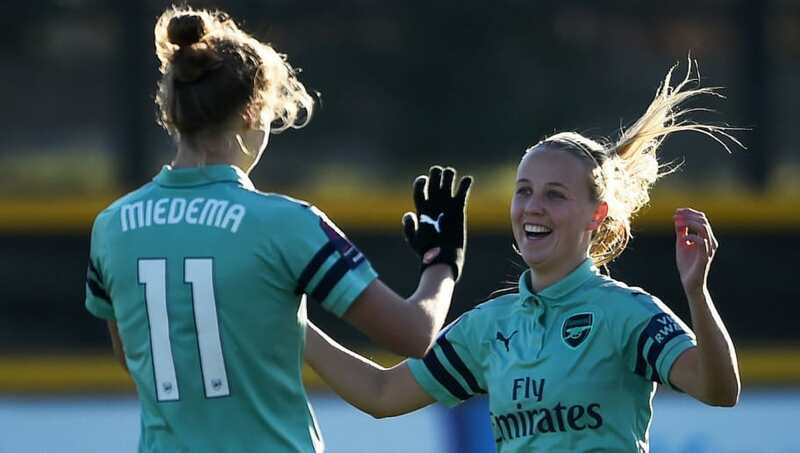 The free-scoring Gunners have now scored 38 WSL goals in eight games so far this season, an incredible average of 4.75 per game, and have conceded only four times at the other end. Second place Manchester City were not in action this weekend. Reigning champions Chelsea are finally starting to find some momentum after a very slow start to the 2018/19 campaign. Their 5-0 win over Yeovil was a third straight WSL win after previously winning only one of their first six games and they now up to third, eight points off the pace. Mille Bright, Ji So-Yun, Erin Curthbert (speaking in the video above), Ramona Bachmann and Beth England all scored for the Blues. Birmingham returned to winning ways after goals from Kerys Harrop, Emma Follis and Lucy Staniforth were the difference in a 3-0 victory over West Ham. They remain level on points with Chelsea but have actually now been leapfrogged by the Londoners on goal difference. Reading were also comfortable winners on Sunday after inflicting a sixth WSL defeat of the season on Brighton. Veteran midfielder Fara Williams netted twice for the Royals, with Brooke Chaplen and Gemma Davison also scoring in the 4-1 win. 24 hours earlier on Saturday, Bristol City beat Liverpool 2-1 in a tight contest. All three goals were scored in the first half, with Courtney Sweetman-Kirk unable to inspire a comeback from the Reds after Bristol had taken an early 2-0 lead through Lucy Graham and Ella Rutherford. Liverpool have now lost three straight WSL games and were leapfrogged by Bristol as a result. The race for promotion at the top of the Women's Championship continues after both Tottenham and Manchester United won on Sunday. Spurs remain top after a slender 1-0 win over Charlton, while unbeaten United are kept the pressure on after hammering Crystal Palace 5-0. Durham and Charlton are also still in the mix as four clubs battle for just two promotion places.